I still have a n64 from when i was a child. Thats always fun to fire up! Retro only for me these days. First-person / COD games are so real these days that they give me anxiety. I'll admit, smoking sativa-dom. hybrids all day probably doesn't help. GTA5 was FUN when I first got it tho. Too addictive! Fallout 4 and The Witcher 3. Plants vs Zombies with my little girl and also Star Wars Battlefront. Play Grand theft auto or black ops when I'm high LOL!!! You know even my black ops is player online LOL! I have been enjoying video games for a very long time now. then playing pong on a table top set up with pitchers of beer in a bar in Bethlehem PA.
Video games and sativas; a match made in heaven! I currently use my Xbox 360 and PS 3. I have yet to upgrade to the new consoles. I haven't played in a while, bit I used to love to play Cod zombies on xbox 360. Many many 30+ round games. If your a racer and want to hook up with a bunch of guys who race and pit to smoke up hit me in a PM and I'll get you my gamer tag. None of us take it that serious, but we do race as clean as we can. Outside of that, I stick to PSVR games as it's just way too much fun. Nice to see this thread get a bump! Fallout new Vegas, fallout 4, oblivion, and skyrim. Final fantasy 8, fallout new vegas, street fighter, and good old ninja gaiden series, are my all time favorites. My hope is someday they give us an open world rpg style ninja gaiden. I'm big on RPGs. Mostly a PC gamer though. Final Fantasy 6j/3us is my all time favorite. Played World of Warcraft since beta... off and on since Wrath. I look back and can't believe how much time I invested into that damn game. I ususally buy every expansion when it comes out, play for a month or two then quit again. Old habits die hard. Don't have any current gen consoles, still rocking a ps3. Would like to get a Switch at some point. That's the one with kefka as the final boss? If it is that one was simply excellent. If I'm not mistaken that's the first ff villain to actually commit genocide. The story and gameplay was most excellent! i used to play in CS 1.6 / CZ leagues. world of warcraft, lineage 2, league of legends, dota, starcraft, day of defeat, CoD 1 to 4 (PC), team fortress, etc. of course my first prob 5 years of PC gaming was a MUD. 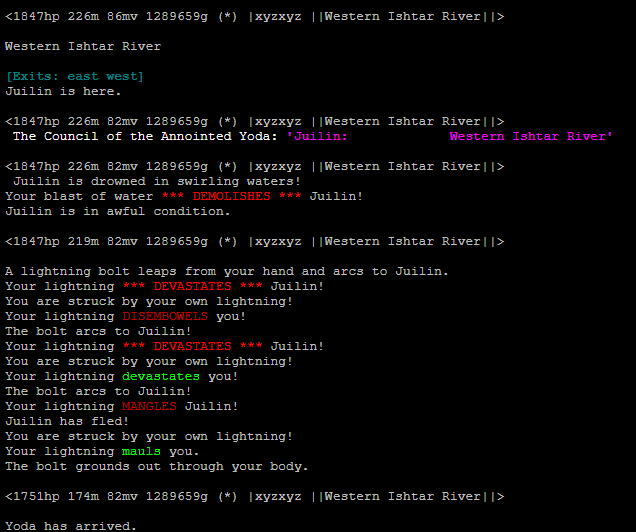 a completely text-based multiplayer RPG. PKing (pvp) was way better than any graphical games i've ever played. Played that since the days of Dial-up. They closed it quite some time ago, I keep hoping for a re-emergence lol. of course my first prob 5 years of PC gaming was a MUD. i remember playing muds in highschool, even started writing one with some friends.